Reading an article in which someone does a deep dive into a phenomena that you haven’t quite been able to put your finger on, but has been bothering you for a while, is a wonderfully legitimizing experience. I suppose there’s something to be said for confirmation bias somewhere in there. The day of President Trump’s inauguration, I headed to work in a fabrication shop in New Orleans for a film I was on. I expected some grim faces, storm clouds over our heads, because this was indeed a dark day. What I didn’t expect, but maybe should have, was all of my colleagues sitting around a table at 8 AM, listening to the news for Inauguration day, passing around a bottle of whiskey and smoking cigarettes. Sus, one of the carpenters who also happened to be a lesbian, openly wept. I can’t fault her for it. This was a very bad turn of events, and whiskey can be really good in the morning every once in a while. But since then, there’s been a consistent tone of “the grass was so much greener, perfectly green even!” about the past that I find troubling, and Marco Bohr hits the nail on the head. Part of a balanced breakfast when in the presence of power tools and a dystopian future. 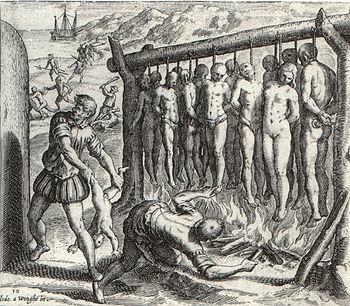 — Historian Philip Wayne Powell, "Tree of Hate"
I think you could technically use this as a metaphor for what the Spanish did to Native American populations, but specificity is pretty important. It’s important that people of prominence like Marco Bohr expose the vulnerabilities in our respective crafts and our social systems at large, especially while adding the context that tempers our partisan anger to some degree. This kind of dark creativity has been and always will be used to manipulate people on every scale, and we need to be informed to allow our faculties to address the assault. We also need to be aware of the ways in which the people we support are manipulating us. Obama’s press circle never sent out pictures of his staff selling weapons to Saudi Arabia that were ultimately used on the children of Yemen. We got pictures of he and his family playing in the surf of Florida after the massive BP oil spill in the Gulf, saying that we were “open for business” again while thousands still struggled with contaminants from the disaster. If we, as a global culture, put more emphasis on critical thinking and skepticism in every facet of our governance and business, we’d be much better off as a species. Being in a time where many artists (and people in general) blurt out "quantum mechanics" at the drop of a hat in any conversation on any topic in order to sound clever, I admit to being suspicious of this piece from the beginning. Gratefully, Seppänen delivered an excellent, knowledgeable piece, getting deep down into the nitty-gritty, refreshing some basics of physics and chemistry and giving me a headache by the end. I loved it. What Quantum Mechanics looks like, apparently. Intersectionality between the arts and sciences is a passion of mine. STEAM power, as a friend in glaciology refers to it (Science, Technology, Engineering, Art, and Mathematics), is one of the best chances we have going forward to communicate the importance of difficult studies and subjects to the average person. It seems to me to be an integral part of making arguments for research-based information and action on climate change. This kind of work, though, requires a more meaningful, thorough engagement with science than artists tend to take. Many I’ve met in the arts community, eschewing authority by their very nature, tend to prefer trends and buzz words around science, consumable tidbits that are dropped at the first sign of admitting others may know more than oneself. Thoughtful writing like this gives me a great deal of confidence moving forward in my own attempts to bridge the gap in a meaningful way. Seppänen offers a useful format in that pursuit, first delivering heavy, migraine-inducing context for the more ephemeral questions further on. This gives a grounding for the audience, something a little more solid to stand on. Rather than questioning the nature of photography alone, he first describes the actual natural processes by which photography captures an image, then speaks on specific qualities and relates them to larger philosophical ideas. That specificity is important, because people tend to not give a damn when presented with something far away, emotionally "blurred" by distance. It’s the same reason we have difficulty experiencing empathy when presented with large numbers in disaster statistics, but tend to feel obligated when someone in crisis directly asks for our assistance. Breaching the philosophical and existential questions of reality and its documentation is an impressive undertaking for such a short paper, especially one so well executed. He dances around the notion of the Trace tearing away a part of the Object, like the old trope of a photograph stealing your soul, and uses that to explain the electromagnetic resistances that make up everything around us, as well as describing some fairly complicated processes light and transmission. Then, not satisfied with such a clever leap, he extrapolates that further to images being sent from another planet. While I think there is a way to make this more accessible for larger audiences, the amount of data here with which to derive that more accessible piece is fantastic. I look forward to researching the author more to get a good handle on this form of communication for my own purposes. As usual, there’s a lot to unpack here. I mean, Freud gets mentioned in the first few paragraphs, which rarely means a subject is going to be particularly happy. Imogen Racz is a lecturer here in the UK and self-describes in her bio using a lot of the same keywords as in the text, particularly relating to experiential art, memory and ideas part of humanitarian exploration. That sounds like word salad, but it’s a little hard to precisely put into words. It does make sense when she puts it together, especially in this well-researched, deftly written piece. She starts off with some context, on Frued, the Unheimlich (or, the Uncanny), and Dada. I particularly liked her reference to Max Ernst, whose paintings I’m a big fan of, in his speaking about Neo Dada—that Dada was an exploded bomb not requiring reassembly. She goes on to explain a bit about gender roles and femininity as both object and subject within Dada which, though a surrealist and far more egalitarian movement than most previous, was still heavily weighted toward male artists and their viewpoints. Peering into the unique works offered by women in and around the movement, Racz shows us the reclaiming of the home and items therein, using non-art materials for pieces like Méret Oppenheim’s Object: Breakfast in Fur, which I find to be horrifying and wonderful all at once. Max Ernst, depicting totally normal, not at all weird stuff. There’s a decent amount of wordage devoted to linking Gothic literature and the artists spotlighted that I think is fairly brilliant, especially with the mention of Mary Shelley’s masterpiece, Frankenstein (arguably the progenitor to the Science Fiction genre). All three of the following artists, Louise Bourgeois, Mona Hatoum, and Gregor Schneider, are exploring the uncanny, often looking at the home through something of a warped lens, denying or augmenting the humane, warm, and comforting feelings associated with Home. Frankenstein chronicles the sojourn of a patchwork man and the struggle he endures as an adult rendered without any childhood, attempting to fit in, find his place, deal with his emotions, and face the rage he feels for his creator. He eventually finds that the only cure is complete solitude, to escape into the perfect strangeness of the arctic where he can’t hurt or be hurt by anyone. Relating that to the work of these artists is not exactly a long leap. Bourgeois’s work often reflects ‘the confined woman,’ deals with the juxtaposition of the physical home and the psychological dwelling, and the effects of trauma and memory on the associations with comfort. Hatoum’s work seems to largely reference her ethnic background and life as a stranger in a strange land, a state of flux within a home that gives ambiguous feelings as to belonging, fitting in with the Feminist movements challenging the home as a natural and comforting place. Schneider, perhaps the strangest, presents altered, not-so-fun-house versions of reality wherein even the air can be affected, where scale and shape conspire to give you a feeling of the dreadful familiar. In all of these, everyday items, spaces and materials we inhabit every day, the artists manage to inspire an “otherness” in the viewer. 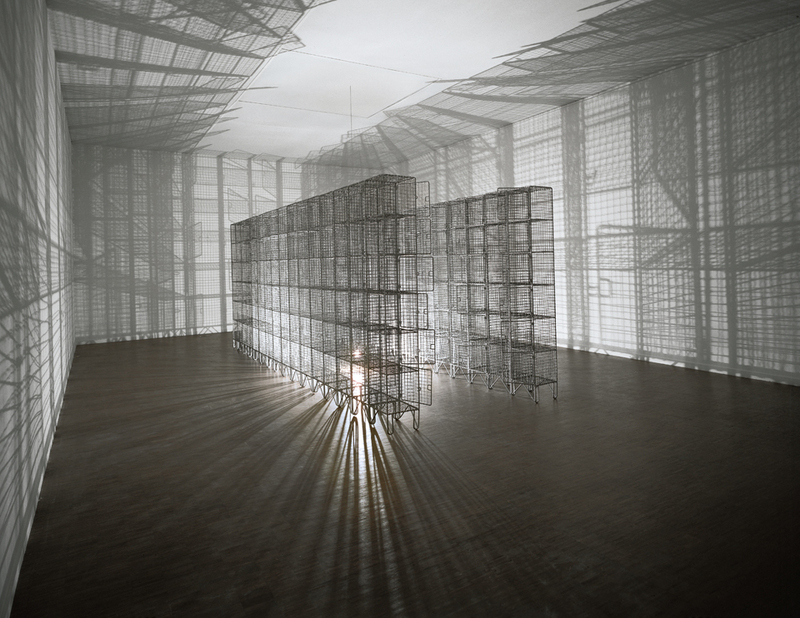 Hatoum’s Light Sentence, which she apparently pulled straight from our collective nightmares. Maybe I’m going out on a limb here, but it seems like a great deal of artwork may stem from the alienation of its creator in one way or another. I feel fairly lucky to be alive in a time and place where, in spite of all of the social ills that do exist and persist, I get to hear about the specific estrangements of individuals who come from very different backgrounds than I. Women, people of color, folks of all economic classes, people who may look like me, but not be like me—it’s easier now more than ever to access the thoughts, feelings, and work of others who truly feel like “Others.” And, I get the notion that most of us who are making artwork likely fit into that category in some fashion. A quick disclaimer before we really get into the text. I’m going to avoid focusing on writing style, because it’s there that I took the most issue, primarily in the first six or so pages. But I have to say a little to begin with, just to get it out of my system: Some of the self-indulgent, artist-elite vibes in the opening sections did not feel off to a good start. It didn’t last long, but it put me off the work immediately. For instance: “The skin of this parent-object is then split open, destroyed as it gives form to its new (child) object (the mother’s body is torn to pieces).” The entire point of metaphor is that it is an elegant stand-in for your larger idea, thus saving you from spelling it out entirely. While the addition of myriad parentheticals to a piece may make it seem hip and clever to the writer, it screams of indecisiveness to me. Now, there’s a lot of good in this text not much further on, and work focused on people who are in-the-know on contemporary art is naturally not necessarily without value. My feelings on this may be entirely personal preference--I understand appreciation for exploratory musings on the whys and wonders of a piece. For me, I’d prefer to simply ask the artist their intention and be somewhat done with it. Its impact beyond that will be self-evident in the way it moves the average person who views it to further conversation (as evidenced later in the text), not in the masturbatory tete-a-tetes of the art world. For instance, the assertion that, “The child is deemed vulnerable in that he or she is dependent on the house as shelter for survival,” completely disregards the fact that we are all dependent on our homes, and that while we here wax poetic about artwork there are adults without homes suffering, sometimes dying, from that very lack. I appreciate the many excellent examples of other works she brings in throughout the text, but it seems to me that conversation about the meaning of art and the feelings associated with the problems it calls up into the collective consciousness without recommending a way to positively combat those problems and ideas is a conversation without substance, hot air without a balloon--you’re not going anywhere. But, I digress. I’ll start off by showing you some of the excellent photographs that John Davies, in partnership with the artist Rachel Whiteread, took throughout the process of making and destroying House. It’s a little difficult to discuss such a profound and difficult work without first getting a sense of scale. One can plainly see why Ashton mentions the “caresses and attacks of passers-by.” A work like this would command a great deal of attention from people of all classes, out of curiosity and respect for the magnitude of the creation. A prevailing trope in this treatise is tying the technique of casting to processes, both emotional and physical, mentioned throughout. The skin we wear, photography, our psychological “skins” all receive this treatment. As someone who has been lucky enough to work in shops, on houses, and overall in more “mundane” applications of art and artisanship, this rang true with me. It’s not only the size, location, and skills involved in the making of House that render it so memorable to people, it’s also the vulnerability of a piece placed as such, out in the elements, available to the public. Ashton mentions the world of ‘Do Not Touch,’ a world which I largely appreciate for the preservation of objects for other people. However, that very world is what makes accessible work like this so valuable, so memorable, and so important and impactful. I’ll admit that the author largely lost me in Symbol, Site and Structure. It wasn’t just that it failed to hold my attention due to content that doesn’t interest me, but also that I disagreed with a lot of the prescribed intention and consumption. Again, this is the work of an artist who is alive and still creating--I find this kind of forceful language on “this is what the art means” without the simple, humble addition of “this is what this art means to me” to be off-putting. Yet, Ashton is clearly a well-read and -referenced professional, and some of the paths she goes down in this section are fascinating. All of the writers and artists throughout are extremely worth a look, from Bachelard, to Barthes, to Bourgeois (I’m getting the feeling there’s something about B’s here), and beyond throughout the piece, she’s given us a ton of research to do on wonderful bits of contemporary art and thought. This includes the work of sociologists Sarah Holloway and Gill Valentine in a much-appreciated inclusion of the sciences. The points extrapolated from that inclusion feel a bit broad at this point, but it’s still clearly the work of a strong researcher. This does heat up a bit in the offerings of Don Slater on women and children being “restricted in belief and practice to the private world of the family which is subordinate to and ruled (through the male breadwinner) by the public sphere.” I don’t know how much these directly relate to the piece, but it is a fascinating point to bring into play. The Victorian stylings of the structure itself must call into mind that “cloying sentimentality” mentioned here. Ashton ties this all together very well with Simon Watney’s Ordinary Boys, but I was slightly troubled with the lack of a direct challenge to the Victorian ideal of sexuality as a negative, or as a threat to children. It may be that the subtlety of the argument was lost on me, but since I come from America, where many of the Puritanical and Victorian ideals still hold horrible sway on our ideas of sexuality and gender, a little more directness would be appreciated. In Photography and Scultpure we have (to me) the beginning of more interesting arguments for the remainder, starting off with questions on the relationship between a short-lived sculpture and the photographs not only bearing witness to it, but becoming valuable artwork in their own right. This is followed directly by History of a House: An East End Sculpture wherein we get to the effects a profound work like this have on its public environment. As ever, when polarized political groups are presented with something to be used, they will use it with vigor. The writer gets deep into the theories on house, home, and the psyche, citing some fantastic researchers here, expertly bringing Doreen Massey’s writing on the ‘politics of location’ into play. This is where the text has some real teeth: in exploring the very real and very difficult realities that House was constructed in. Ashton’s clever discussion on the different definitions of “nostalgia” and our memories allude to one of the objects House most looked like to me upon first viewing: a gravestone. Wrestling with the ideas of recording and “memory-work” is compelling, as ever, here. The notion of a cast interior as documentation is what was so enthralling about the piece to me in the first place, a recreation that is, but isn’t, what it sought to document. Like a 3D blueprint, it gives you a good idea of what was there without imparting any of the emotions, textures, or memories associated with that place. Davies’ images are then a further removal from the original copy, but no less valuable. As mentioned in the text, they add the theatrical setting indicative of “street photography,” but with some addition-by-subraction included--House is rendered lonely in these images, absent the populated and messy environment of 193 Grove Road. After getting a look at Davies’ other work, thanks to the well-written, concise history in the text, it makes sense why Whiteread would seek him out for this project. So much of his work mirrored the original piece, with “a deliberate framing of a space through classical detachment and an allusion to a mystical landscape.” Going further than just appreciating his work on this piece, Ashton brings into play a challenge to photography (and Whiteread’s casts) as evidence of personal history in general, by asking the question, “what was not photographed”? Ashton’s final argument on the destruction of house is accurate and eloquent, but for one aspect. She argues that, “The house is the ultimate consumerist object; a bourgeois myth which ‘empties reality’ and thus enables the domestic sphere and its ‘family’ to proceed as a ‘natural and eternal justification [...] A myth ripens because it spreads [...] A ceaseless flowing out, a haemorrhage’. The disruption of the house (via casting) and then its destruction is a violent stopper to such a haemorrhage.” I agree with the notion that it’s a stopper to “such a haemorrhage,” but for a slightly different reason. While real-estate has most certainly acted as a bourgeois ideal, often acting as a status symbol or bargaining chip for the wealthy, an item that acts less as a home and more as a simple asset, the trade of art has been close on its heels for some time now. It’s a lucky thing that House was demolished in the nineties and didn’t live to the Now, or we may be seeing its casts sold off for hundreds of thousands. In a world where art as a commodity has, according to Larry Fink (CEO of Blackrock), become a contemporary of real estate in New York, Vancouver, and London, perhaps it’s better to be a ghost. Anyone who is capable of writing about complicated people fairly and deftly should be celebrated, it being far more difficult than it appears to step back from our own biases, reveal information piecemeal, and give the audience a chance to glean meaning for themselves. Our author, Alyssa Grossman, shows here that her background in both the science of anthropology as well as visual arts and storytelling have been carefully synthesized over the years. This piece, while holistically about Sophie Callie and her career, is greater than the sum of its parts, reading as a thoughtful presentation on ethics and what it means to be an artist interfacing with the sciences and with the world. The time frame of writing is important as to this overarching question. The late teens of the new millennium appear to have all the growing pains of the average teenager heading into their twenties, full of questions, doubt, anxiety. Fear and loathing of and for our predecessors. I see this as a net positive, especially when considering artists like Calle in their early years. While experimentation is generally good, it can and does harm other people, and we must be careful of exposing others to harm while pursing our art. In addition, while all of us do love to wear the fancy hats that come with being an anthropologist, ethnographer, scientist, engineer, or what-have-you, it’s paramount that we not muddy the waters of discovery with our art. If anything, our art should be used as a sieve for these professionals, a way to simplify and render their information potable for the rest of the world to consume. These are the kind of scholarly questions posited by Grossman (far more eloquently) in the closing of the text. Yet, it’s preceded by an exploration of Calle’s installation, Take Care of Yourself (2007) that reads as very loving and inspired, and I can’t blame her for feeling this way. Calle’s later work is far more fascinating to me, seeming to be curious investigations into experience, thought and memory, into the little stories we tell ourselves and the constructions we attempt to make our lives and narratives fit, into even the perceptions of beauty by the blind. This kind of work is what makes art valuable to me. Because of that value, the closing paragraph of questions is a strong finish to the text, opening up a conversation artists consistently need to have with each other and ourselves about not only creating, but why, for whom, and how we should do so. 1. What was the reaction of “average people” to Calle’s early, salacious work? How would it be perceived by contemporary youth who are very sensitive to their privacy and ownership of it? 2. What began the turning of the tide on artists moving away from “reductive and dichotomoising ‘self/other’ paradigms”?